Here’s a great storage idea! We've expanded our family of shelving units to include fun new Baltic Birch versions of our phenomenal cube bookcases. Minimalistic, yet sleek and trendy, these Mid Century Bookcases and compatible designer storage boxes are great in the living room or adult bedroom. They utilize space in small homes and apartments, and solve all your organizational dilemmas. Also use our large cubby storage units in the kids’ room, playroom, or nursery for all your kids furniture needs. Don’t forget that our decorative cardboard storage bins work perfectly with all cubby shelves, and provide tons of space for the necessities that come with having a family. Tired of having complicated assembly processes, losing tools and screws, and getting frustrated? Sprout tension lock tool-less furniture assembly takes all that headache away. The construction of our Mid Century Bookcase is completely tool-less, and takes less than 10 minutes! 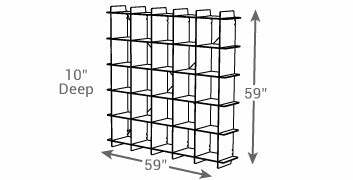 The joints are sturdy and strong, and you can disassemble this wood cubby bookcase quickly, and collapse it to make it super easy to transport. Moving furniture was never easier!